Get a great price on the SMOK E-Priv Kit from Vapor DNA. 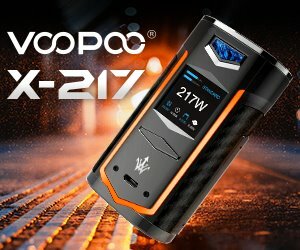 SMOK seems to be going through the letters of the alphabet with its ‘Priv’ series of mods. So far we’ve seen the H-Priv, the G-Priv and G-Priv 2, the T-Priv, X-Priv, the Priv V8 and SMOK doesn’t seem to willing to abandon their alphabet-inspired naming habit, as they only recently released the E-Priv 230W box mod. 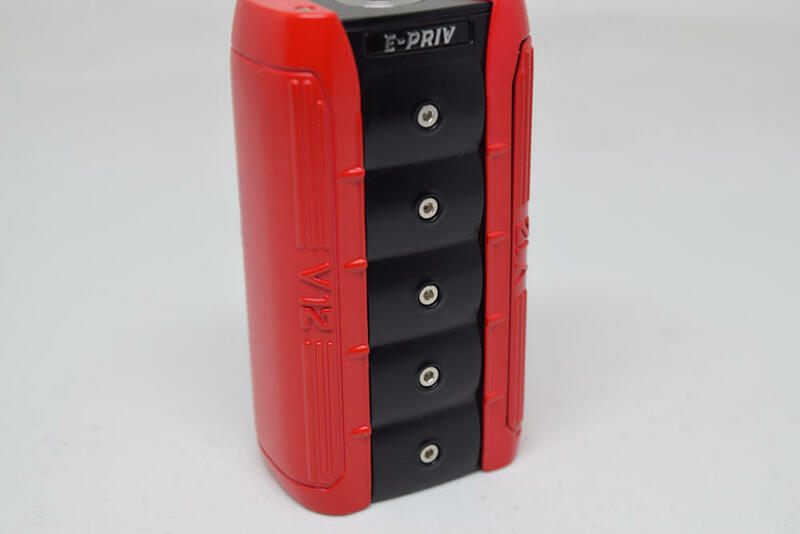 Featuring a design reminiscent of a sporty V12 engine as well all the advanced features you could possibly need, the E-Priv is a fine addition to the Chinese company’s ever-growing family of mods. 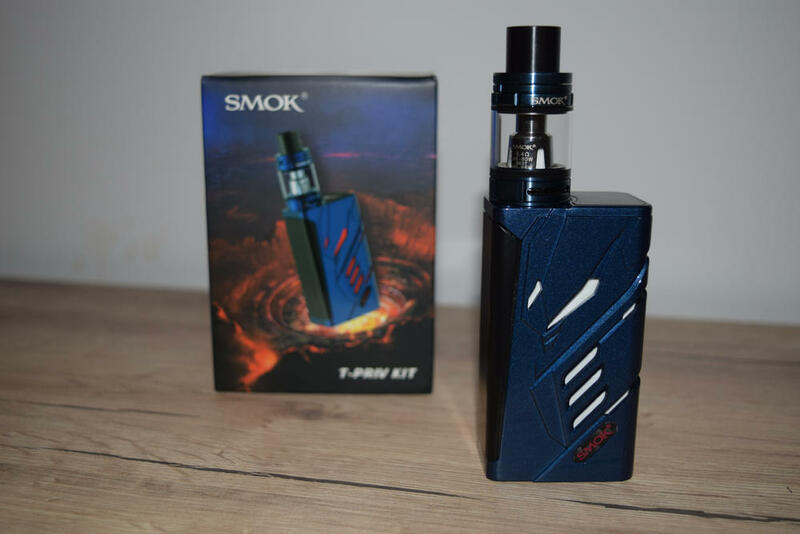 But what really makes this kit interesting is the inclusion of the well-known SMOK TFV12 Prince sub-ohm tank with not one but two types of mesh coils. 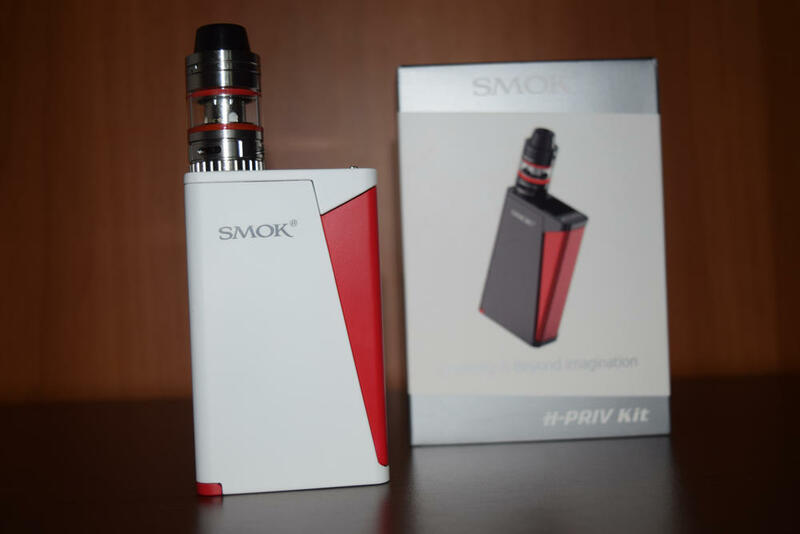 The E-Priv kit comes in the usual SMOK packaging, a large rectangular box with a colorful wrapper featuring the assembled E-Priv mod and TFV12 Prince tank on the front, pictures of the two different types of mesh coils (called ‘hyper engines’) included, on the side, and a short description of the kit, as well as a list of kit contents, on the back. 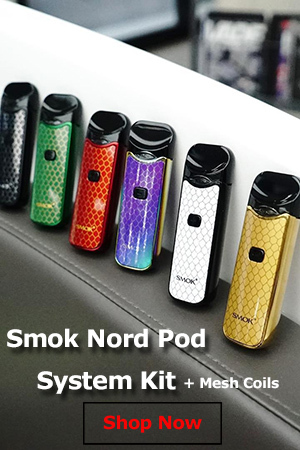 SMOK’s packaging has remained the same for a while, which makes sense, as they do have some of the most attractive looking boxes in the industry. Inside the package, we have the beefy 230W E-Priv mod sitting nice and snug in a black styrofoam holder, and underneath that are the TFV12 Prince sub-ohm tank, a micro-USB charging cable for the mod, a spare-glass section, some o-rings and gaskets for the tank, a mesh coil-head (another comes pre-installed) and a user manual. All in all, a nice kit that includes everything you would expect. 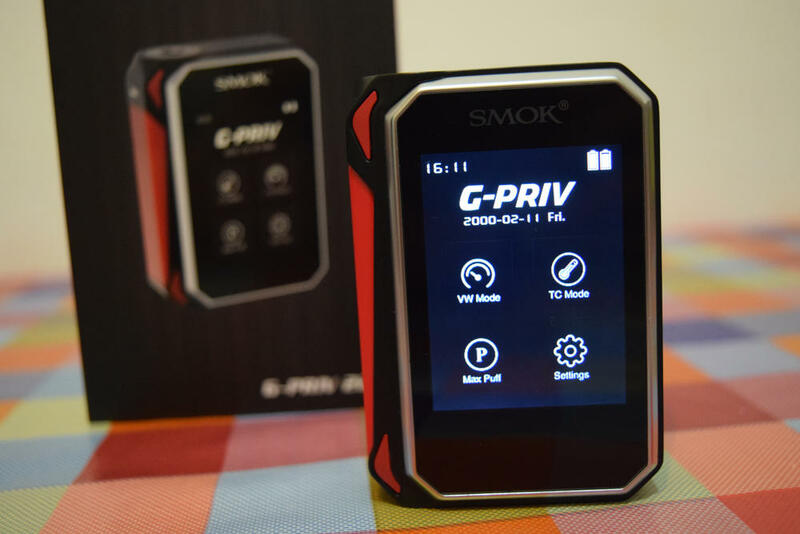 As I mentioned in the introduction, the design of the SMOK E-Priv box mod was inspired by the powerful V12 engine in most racing cars. I’m no engine connoisseur, so take my words with a grain of salt, but this doesn’t look like a V12 to me. I mean, if you’re looking for an engine-inspired vape mod, just take a look at the Augvape V200, which actually looks like a miniature Honda Type-R engine. If not for the V12 stamped in four different places on the E-Priv, I never would have guessed that this mod was inspired by a car engine. Now, that’s not to say that the E-Priv is a bad-looking vape mod. In fact, I think it’s one of the nicest-looking devices the Chinese manufacturer has ever made, and the build quality is impressive as well. Apart from the small logos on either side of the mod, which are made of cheap plastic, everything else, from the fire bar to the battery door feels very solid. I actually received two samples for this review, and neither of them have any issues. The paint job is flawless, there’s no rattle, and they just feel sturdy. Like most other SMOK mods, the E-Priv is made primarily of zinc alloy, and measures 85mm x 47mm x 31 mm. It weighs a hefty 195 grams without batteries, and comes in five different colors. Both the samples I received were red-and-black, but that’s my favorite combination out of the available ones, so I don’t have any complaints. At the top, the E-Priv features a standard 510 connection with a spring-loaded, gold-plated 510 pin. The connection is centered, and that’s a plus, but note that the plate on which the connection placed is slightly lowered into the body of the mod, so the two metal edges of the device prevent you from using atomizers with a diameter of over 26mm. Granted, most tanks and RDAs are smaller than that, and you were going to have some overhang on the narrower edges of the mod anyway, but it’s important to keep in mind that you will not be able to use giant atomizers like the Triple RTA on this mod, because of those two raised edges. The E-Priv features a metallic firing bar, instead of the classic fire button. 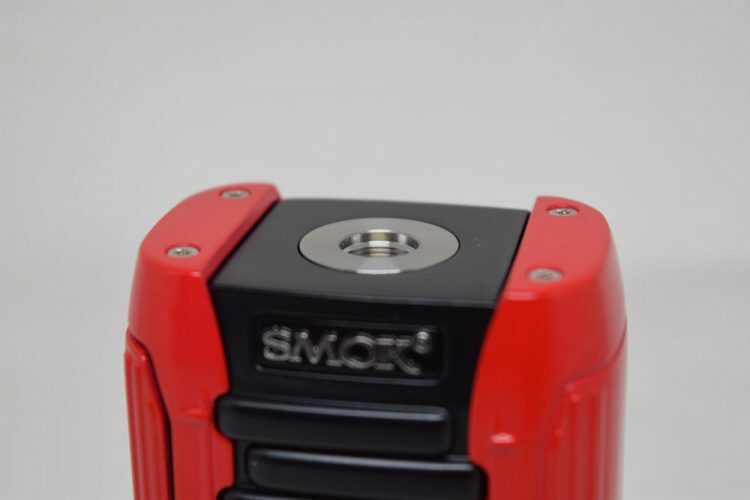 This isn’t unusual, in fact, SMOK was one of the first, if not the first to use firing bars, on the legendary X Cube box mod. They’ve been improving them over the years, and the one on the E-Priv may just be their best one yet. 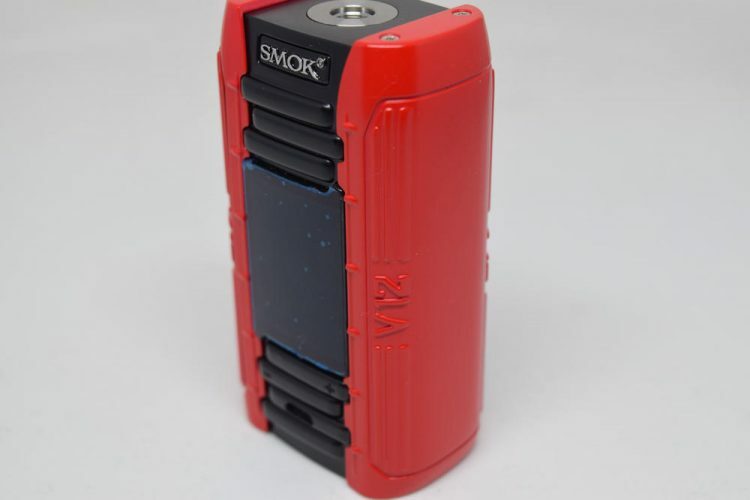 It’s sturdy, doesn’t move at all, and can actually be pressed on most of its surface, even close to the bottom, which cannot be said for older mods, like the SMOK Alien. The battery door is one of my favorites as well. It’s hinged and spring-loaded, meaning it pops up as soon as you pull the small knob located on the outside of the door. 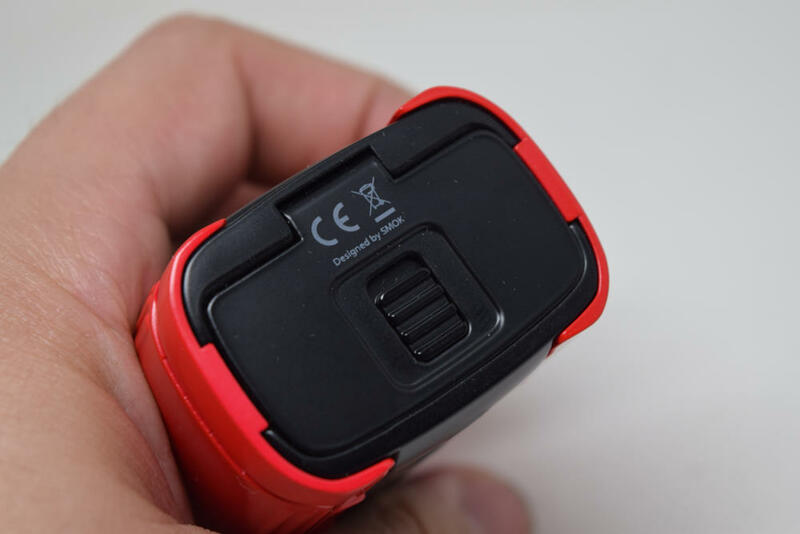 The battery compartments are very clean as well and feature colored polarity indicators at the bottom. Closing the battery door is as easy as pressing it down on the batteries until you hear it click into place. 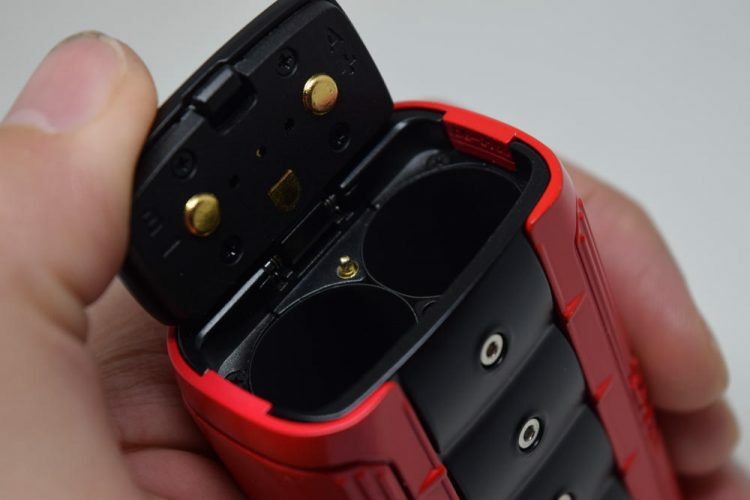 You don’t have to worry about your batteries popping out accidentally because this battery door is incredibly solid. On the back of the E-Priv mod, we have this wavy black pattern with five huge bolts sticking out, which I assume were somehow inspired by the V12 engine, and on the front we have a large rectangular color display, as well as the ‘+’ and ‘-‘ buttons and a micro-USB port for charging and firmware upgrades. The screen is large and bright enough, although it’s definitely not the best I’ve seen, but I have a problem with the design of the adjustment buttons. As you can see in the pictures, on the front of the E-Priv mod we have these sliding line patterns above and under the display. Two of these lines are actually the ‘+’ and ‘-‘ buttons, and I personally have been having this annoying problem where I am pressing one of these lines which I think is one of the buttons, but is actually the other or not a button at all. Plus, I’ve noticed that if you press either of the buttons on the opposite ends of where the ‘+’ or ‘-‘ symbols are, you end up pressing the ‘-‘ instead of the ‘+’, and vice versa. That’s because while they are located opposite from one another, those lines are really close together so they touch the wrong contact when pressed at the opposite end. Still, overall, the SMOK E-Priv is an impressive looking device, and even more so in regards to how it feels in the hand. If you can overlook the uninspired design of the adjustment buttons, everything else is really nice. The general design is easy on the eye and the build quality is top notch. The E-Priv has a different menu system than all the other SMOK mods I’ve tried in the past. I personally think it’s an improvement as I think it makes it easier to figure out for beginners and casual vapers looking to move up to advanced devices. Once you’ve inserted the two required 18650 batteries, you have to press the fire bar five times in rapid succession to turn on the E-Priv. You can do most of the important stuff without going into the menu at all, which I think is really neat. Apart from adjusting the power and locking all the buttons by pressing the fire bar five times, you can also select the operating mode by simply pressing the firing bar and the ‘-‘ button at the same time, or set your desired preheat by pressing the fire bar and the ‘+’ button. But if you really want to check out all the features, you can access the main menu by pressing the fire bar three times rapidly. The E-Priv menu features four “pages”, each split into two sections. To scroll between these pages, all you have to do is short press the firing bar and it will jump to the next page, and then back to the home screen. To navigate through the different options in each section of a page, you just use the ‘+’ and ‘-‘ buttons, and to jump to the bottom section of each page, you long-press the fire bar until you see the highlight cursor move to the desired option. On the first page of the menu, we have all the different operating modes: wattage mode, temperature control for three supported materials (nickel, stainless steel and titanium) as well as memory mode. In the lower section of this page, we have either the wattage level and preheat (for wattage mode) or wattage and TCR (for temp. control). On the second page, we have the puff options, including setting a puff limit and resetting the puff counter. 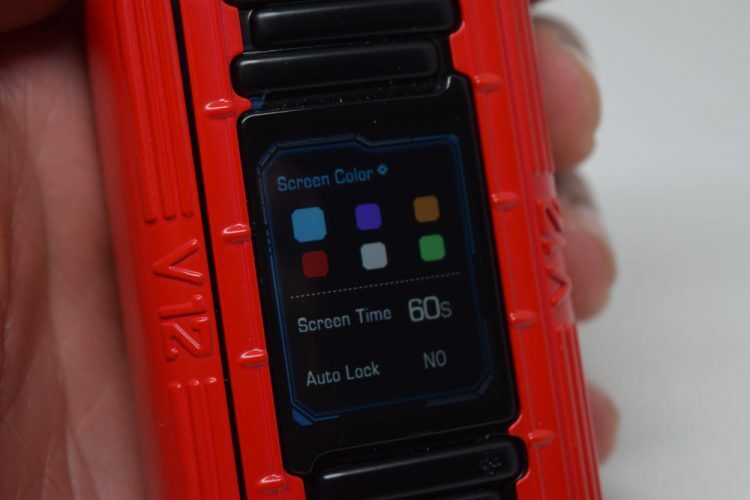 On the third page you can select a different color as the screen background, as well as set the screen timeout, and activate the mod’s auto lock feature. Finally, on the last page you have the option to shut down the mod. That’s pretty much all there is to the menu. It’s really easy to navigate once you get the hang of it, even though you don’t really need to go into the menu at all to use this mod. 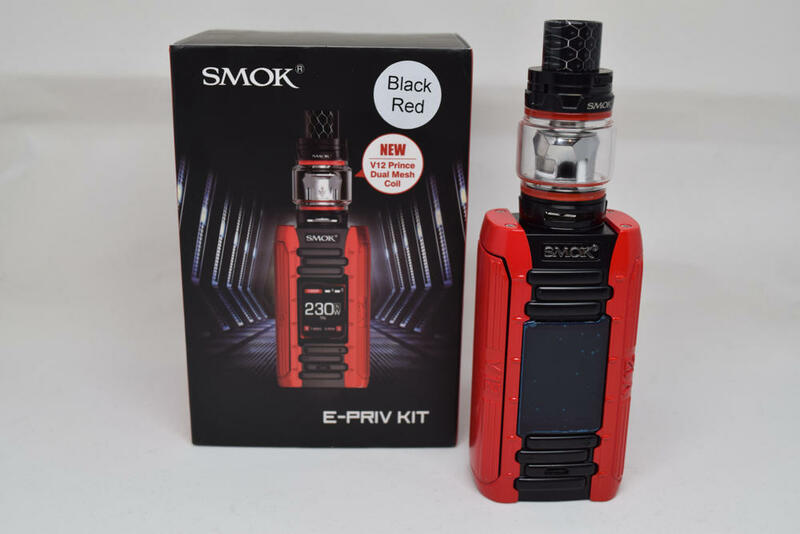 The SMOK E-Priv is powered by two 18650 batteries. Battery life depends on a lot of factors, like the set power output of the mod, battery capacity and how much you vape, but what I can tell you is that the E-Priv features on-board charging – although I recommend using an external charger – balanced charging, and has charging rate of 1.3A. You might want to invest in a spare set of batteries, just in case one set dies on you while you are on the go. In terms of performance, I can’t really think of any negatives. 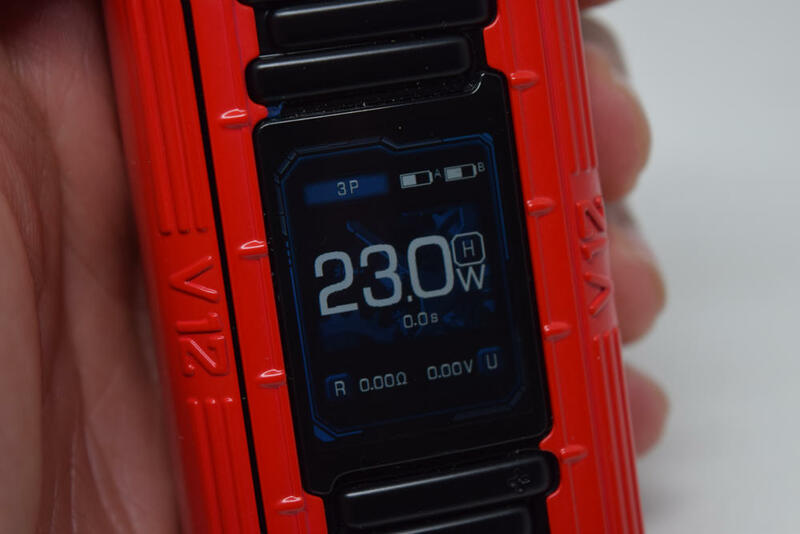 The SMOK E-Priv fires virtually instantly, the power ramp-up is impressive, especially when you have the Hard preheat selected, and I have yet to experience and misfires or other errors. I don’t know if it’s the new Arm-M4 chip, or just SMOK upping their game, but the E-Priv really has been performing very well for me. 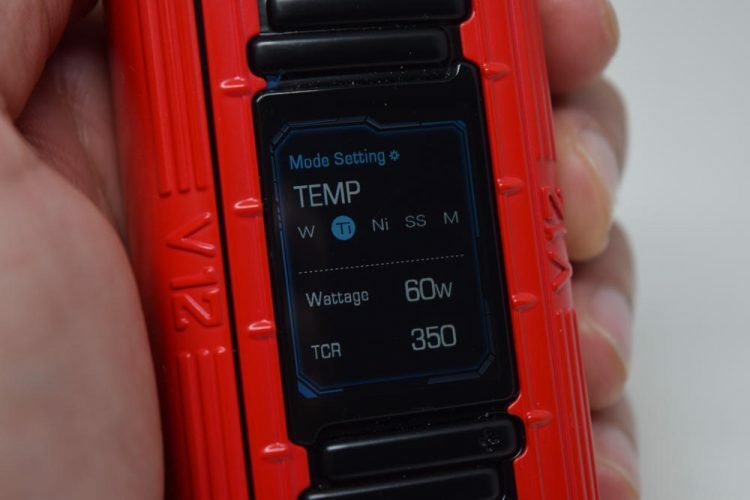 I haven’t really tested the temperature control feature, because I am just not interested in it, and neither are most other vapers, but if you’re curious about it, I’m sure you can find a more informative review.